Laser Dentistry – Now Available at Coburg Dental Group! Laser dentistry is reshaping approaches to oral health care and a laser procedure can be successfully applied to a wide range of oral health needs. At Coburg Dental Group, laser dental procedures are performed by experienced and qualified professionals making them precise, quick and highly effective. Laser dentistry’s ability to improve dental procedures is due to the precision control dentists have over the procedure. The effects of laser dentistry are dependent on both the power output and the duration of exposure on the tissue (whether gum or tooth structure). This allows for treatment of a highly specific area of focus without damaging surrounding tissues. At Coburg Dental Group our laser technology allows us to do both soft and hard tissue procedures. If you consider yourself an anxious dental patient and are seeking safety and comfort, we can help. Our expert team of dental health professionals offer laser dentistry techniques as part of their practices and treatments. Dr. Jeffrey Kestenberg offers a range of laser dentistry procedures in North Melbourne and beyond, and has been using dental lasers since 2002. Dr. Kestenberg is highly qualified and has been training dentists in laser use all over Australia. 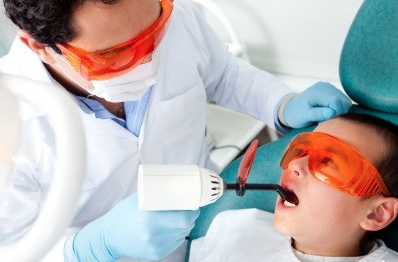 Lasers do not produce the whining or high pitched noises common to traditional dental equipment such as the dental drill. You may experience the sound of rushing air with a faint popping noise, similar to “Rice Bubbles”. Air suction is used to keep the area free of water mist which is sprayed with the laser light. You may feel a “pins and needles” type feeling on the tooth or gum during the procedure but you should be able to relax and be comfortable when the dental laser is being used. Laser dentistry minimizes bleeding. The high-energy light beam aids in the clotting (coagulation) of exposed blood vessels, thus inhibiting blood loss. The application of lasers in dentistry allows dentists to perform a wide variety of dental procedures not possible prior to this technological advance. Dentists using lasers in dentistry have become adept at incorporating the state-of-the-art precision technology into a number of common and not-so-common procedures. Dental Fillings/Tooth Preparation: Hard tissue dental lasers may eliminate the need for a local anesthetic injection and the traditional turbine dental drill. Lasers used in dental filling procedures are capable of killing bacteria located in a cavity, potentially leading to improved long term tooth restorations. However, dental lasers are not appropriate for the replacement of amalgam fillings, inlays or crowns. Gummy Smile: Dental lasers are highly effective in the field of cosmetic dentistry. Lasers can reshape gum tissue to expose healthy tooth structure and improve the appearance of a gummy smile. Lip Tie and Tongue Tie: A laser frenectomy is an ideal treatment option for children who are tongue and/or lip tied (restricted or tight frenulum) and babies unable to breast feed adequately due to limited tongue movement. A laser frenectomy may also help to eliminate speech impediments. If you are looking for accurate, efficient dental care to put your mind at ease, Coburg Dental Group are leading the way with the latest laser dentistry procedures. Contact us to talk through your queries about these exciting new procedures.